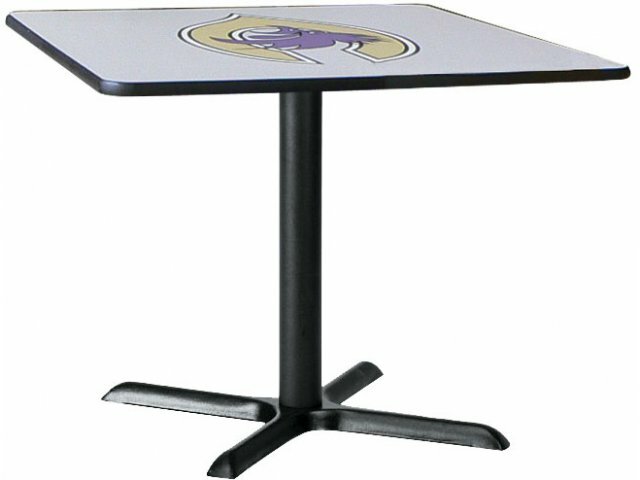 Deluxe Square Cafe Table with X-Base 42x42"
Please call for pricing on custom logos. 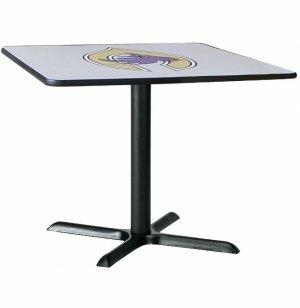 These 42" x 42" square cafeteria tables help you get the maximum out of your floor space. Seats 4. Whether you're adding lunch tables to your present cafeteria or furnishing a new one, Palmer-Hamilton's X-Leg cafeteria tables are the perfect solution. These free-standing café tables offer you great style and superb durability that will serve your school or office for years to come. High-pressure laminate tabletops feature an exclusive EdgeGuard treatment that prevents chipping and is highly tamper and moisture-resistant. Bases are made of 16-gauge steel for superior strength and stability. Available in a wide selection of laminates and sizes. Flexible: Free-standing tables let you modify your cafeteria's setup with minimum hassle. Resistant: Exclusive resin composite EdgeGuard™ treatment eliminates unsanitary food traps, keeps edges sealed, prevents peeling/chipping and is highly tamper and moisture resistant. High-Pressure Laminate: High-pressure laminate tabletops are far more durable than standard laminate. Extra-Strong Base: X-leg base and column are made of 16-gauge steel for superior strength and stability.